Leading companies from the construction and engineering industries will be in Las Vegas from February 2-5 for the annual World of Concrete trade show. This major industry event is the perfect forum for showcasing new products and technology that will impact the market in a powerful way. 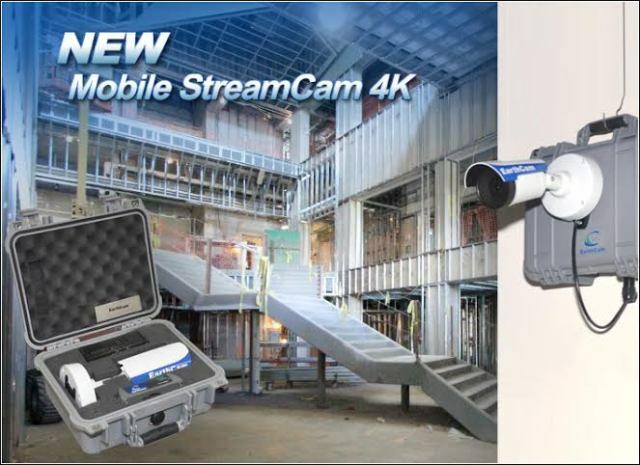 The EarthCam Team will be on hand to demonstrate its new 2016 construction camera line, including wireless 4K streaming video and compact, portable jobsite cameras for contractors. Visitors to EarthCam's exhibit (C4137) will view a live demo of the 2016 product line, which includes the latest innovations in webcam technology. New from EarthCam's experienced engineers is the Mobile StreamCam 4K, which optimizes wireless 4G technology to stream high resolution video, while creating exceptional 8 megapixel imagery for historic documentation. The system is portable and weighs less than 10 pounds, making it simple to move from one location to another. The durable, waterproof hard carrying case doubles as the mounting platform and features flexible 12 Volt DC power options, including solar, battery and auto adapter. With wireless 4G connectivity built right into the case, project managers can broadcast to the internet in seconds, transporting a private group of executives to the jobsite or even a worldwide audience via a public website. The camera includes a 109° wide angle of view, great for getting into narrow spaces and making it a preferred solution for interior documentation. Ultra-HD live video can be transformed into a time-lapse movie to showcase any construction project in a dynamic way. Another exciting addition to the EarthCam line-up is the upgraded ConstructionCam HD. The new streaming camera is robotic and capable of panning 360° to create incredible 225 megapixel panoramas and features extremely high-resolution 1080p video clips. The new technology contains image sensors that are 50% larger than the previous camera and delivers wide dynamic range exposure, providing sharp, vivid video in various light conditions. The webcam technology leader is also pushing the boundaries with the release of the latest version of its construction camera software, Control Center 8. The new version is all about sharing unique project content with a robust package of intuitive tools. Featuring a new responsive HTML5 design that works cross-platform, Control Center 8 displays all the visual information about a construction project on one easy-to-navigate website. The innovative Marketing Dashboard puts jobsite content to work, where the user can create webpages for public outreach and monthly progress reports for internal presentations. Easy-to-access share features provide image filters, markup tools and instant postings to Facebook, Twitter, Instagram and EarthCam's exclusive Hall of Fame. Users can expect this and so much more with EarthCam's next generation software.